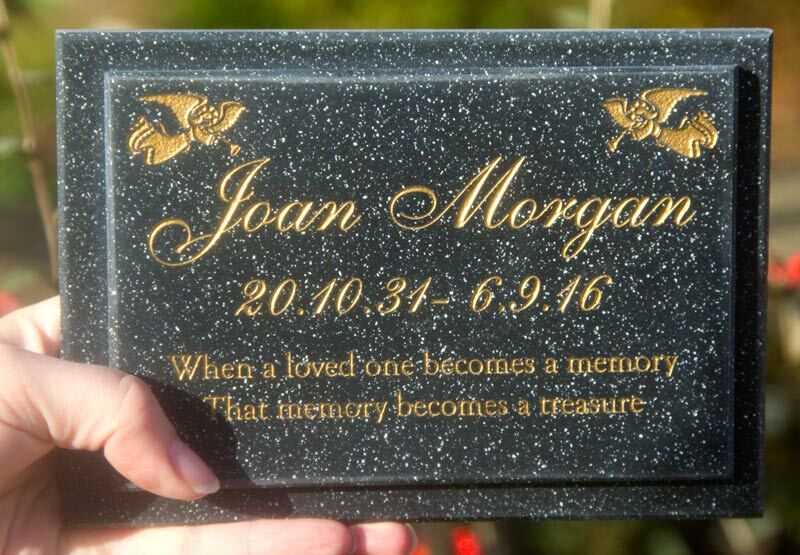 The Sign Maker for the very best in Bespoke Plaques and Memorials: Engraved Corian Memorial Plaques - Memorials which look and feel like real stone & granite. Corian is a mixture of clear acrylic resin, natural minerals and pigments. The mineral content retains quite a few properties of real stone such as the cold feel, matt finish and weight. 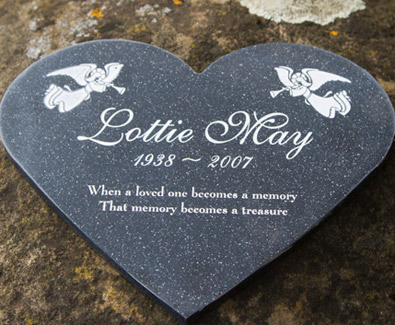 We can also cut your memorial plaque into various shapes including hearts. The cost is £10 but you need to price 25mm larger to account for waste. Click here for some standard shapes. The letters are engraved using one of the our many fonts. Standard letter colours are white, black, Farrow & Ball Purbeck Stone (light grey), Farrow & Ball Lichen (light green). We have a number of other stock colours @ £5, along with memorial gold or silver @ £10. Memorial gold looks very similar to gold leaf. Holes can be drilled if required at £3.50 for four. 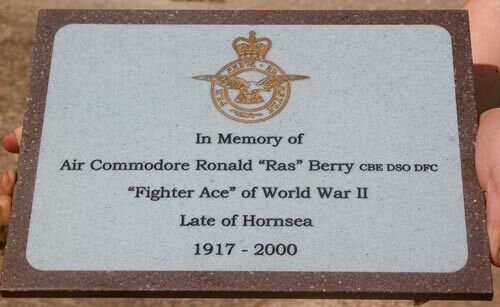 We can include images on the memorial plaques. 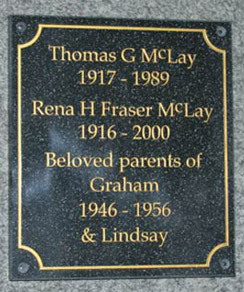 We have a large selection- Any of the single colour images can be used with this type of plaque. Both wooden and corian Backing Boards are available along with a range of Tree Stakes. A corian plaque on a corian backing board is a great look. 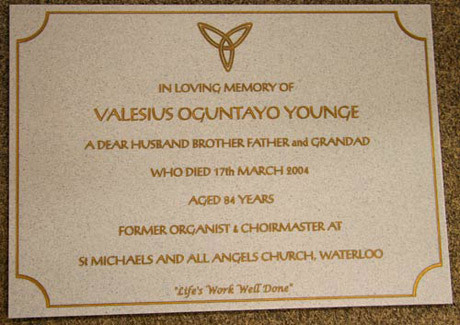 The plaque is attached to backing with industrial strength double sided tape. Another option is a stone wedge. These are made from solid granite or slate and are very heavy. The granite is highly polished whereas the slate is honed smooth. 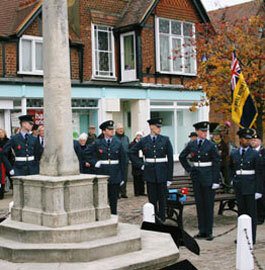 We send the memorial plaque attached to the stone wedge. These have always been popular in Europe but are now seen much more frequently in the UK. 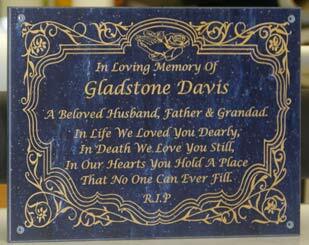 These lovely full colour inlays are made from tough, fade proof anodised aluminium. The standard size is 125mm x 100mm and the extra cost is £98.50. We can quote for other sizes. 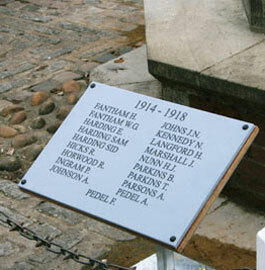 These engraved plaques look very smart indeed and could be used as a special commemorative plaque. 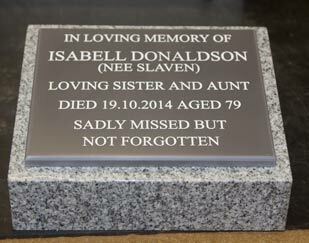 The wording is engraved in the 6mm corian which is then inset into a 12mm corian black-plate. Not only does this make for a very effective engraved plaque but it also enables the fixings to be completely hidden. Click here for details. 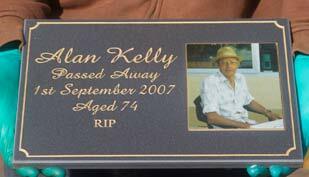 As well as engraving into corian we are also able to laser away the background leaving the letters raised. 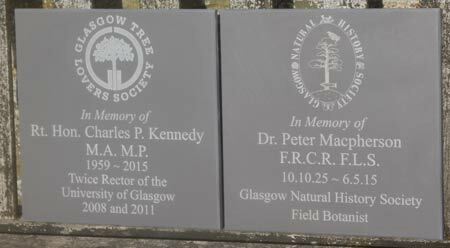 It is a lengthy process with the result, in many ways looking similar to the cast bronze signage but considerable cheaper. 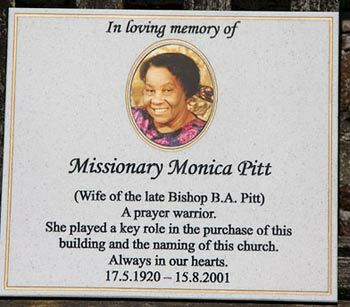 Please use the darker colours in 12mm thick for these memorial plaques. Minimum letter size 6mm. Use bolder fonts and images without very fine detail. 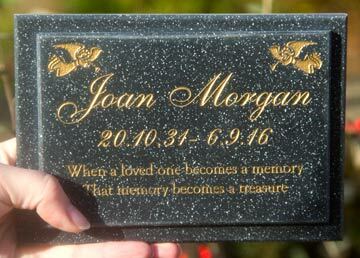 Our team at The Sign Maker looks forward to helping you with your engraved memorial plaque.